Some accepted wisdoms of audiophilia are rarely challenged. For example: the larger, more expensive speakers in a given manufacturers line are always better than the smaller, less dear ones; exotic materials are always superior to run-of-the-mill ones, especially in loudspeaker drivers and cabinets; and there are always audible differences between components and cables. Many times, these notions are true -- but regardless of what the marketers may tell you, they are not absolutes. Every rule has exceptions. One of the most widely accepted of these wisdoms is that more boxes mean better sound: a separate preamp and power amp will outperform an integrated amplifier, monoblocks will better a stereo amplifier, and separate power supplies for each component are better yet. But in the case of the Vitus Audio SS-101 integrated amplifier, this notion -- as much as my audiophile brain wants to hang on to it -- just doesnt hold the water it used to. 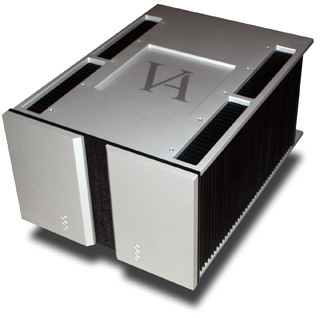 The price alone is a little shocking for an integrated amplifier: $28,000 USD. In most manufacturers lineups, thatll buy you top-of-the-line separates. In the world of Vitus Audio, you get one box. Is that one box all you need for the best sound? Or is it precisely what you need? Integrated or . . . something else? Calling the Vitus SS-101 an integrated amplifier might be a tad misleading if youre used to more conventional designs. It has only two sets of inputs: one set of XLRs, one set of RCA jacks. So its really a two-input power amp with a built-in volume control -- no phono stage, no balance control or tone controls, or any of the other items that typically define an integrated amplifier. But in a minimalist system such as mine, the SS-101 provides all the functionality thats needed. Your mileage will vary. And if you later add a full-function preamp, the SS-101 can be used strictly as a stereo power amplifier; its volume section can be bypassed altogether. 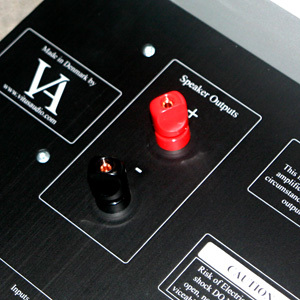 In addition to the two sets of inputs is one pair of large custom speaker terminals that accept spades, bananas, or bare wires. You can tighten these with your fingers -- no wrenches needed. Rounding out the rear panel is an IEC input for your favorite power cord. Functionally, the SS-101 is quite simple, though it has some unique features. 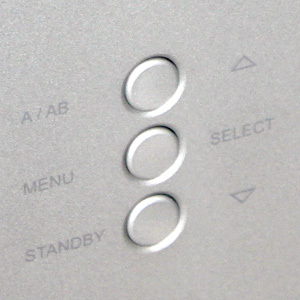 On the front panel are six buttons, three each on either side of a glass insert that runs from top to bottom, dividing the faceplate in two. These control the amplifiers various functions, as does the included remote control: Volume up/down, Standby, class-A/AB operation, Mute, and Menu (brightness of display, input selection, logo on/off, volume bypass). Fairly simple stuff. The amplifier itself is huge: 17"W x 11.5"H x 23.5"D, and weighing 176 pounds. Although an all-black version is available, my review sample was the two-tone model more commonly seen in photos and ads. The faceplate, as well as the top and bottom plates, are silver, the rest of the unit black. The faceplates glass panel has a small backlit readout that indicates volume level and various states of operation, such as class-A or class-AB bias (more on the differences later), or Standby. The Vitus Audio logo glows subtly from behind the glass, though this, too, can be switched off if desired. 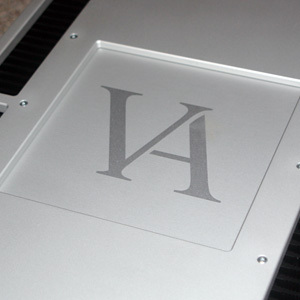 On the top plate, another logo -- a large, recessed "VA" -- also indicates that the amplifier is indeed from Vitus Audio. The top and bottom plates extend to the sides just past the edges of the heatsinks, protecting users from the sharp edges. These plates also extend back over the rear-panel connectors; the bottom plate also serves as an integral handle; cutouts along the edge are perfectly sized handholds for lifting its considerable mass. The build quality is exceptionally rugged, as youd expect for the price. The SS-101s specifications are not full of glamorous numbers that will grab you at first glance: Its power output is rated at 50Wpc in class A or 100Wpc in class AB. At a time when many manufacturers are reviving the power-output wars of the 1980s (Krells latest 900W monoblock, the Evolution 900, is an example), Vitus has taken a very conservative approach to specsmanship. The nutsnbolts construction of the SS-101 is hardly what anyone would call conservative, however. Hans-Ole Vitus, the main man behind every VA product, has stated to me that he spent years investigating and testing various types of transformer before settling on a custom-designed UI-core unit that his research had shown to outperform all others. You can read more about these in my "Searching for the Extreme: Vitus Audio" article, published back in October. Peering inside the SS-101, youll see two massive, stacked transformers and four large filter capacitors. Its fair to say that the SS-101s innards are almost all power supply. The bipolar output stage is actually contained in a subchassis below the supply, hidden from view. The SS-101s fully balanced design also uses no negative feedback -- Vitus feels that this approach yields less listener fatigue and a more natural sound. This he proved to his satisfaction through listening tests with a panel of listeners hes assembled over the years. My review system for the SS-101 was itself a model of simplicity: Wilson Audio Specialties WATT/Puppy 8 loudspeakers and an Esoteric UX-3SE universal audio/video player. Cabling was initially from Shunyata Research, later replaced by Vitus Audios own Andromeda interconnects and speaker cables. Power to the source was conditioned by a Shunyata Research Hydra Model-8. The SS-101 was fed by a dedicated 20A line in my Music Vault listening room. Another bit of audiophile wisdom worth dispelling is that a more powerfully rated amplifier will always sound more powerful. Trouble is, Ive come to realize that the power ratings supplied by manufacturers are in practice virtually useless. Ive heard amplifiers rated into the hundreds of watts that sound anemic, and amplifiers rated at less than 100Wpc that seem to have limitless power. Regardless, the 50Wpc-in-class-A SS-101 was a bottomless pit of power driving the Wilsons. Replace your 400W beast with the SS-101 and you might just have the more powerful-sounding amplifier. Go ahead and try it. I dare ya. On first hearing the SS-101 in my system in class-AB mode, my impression was of a natural-sounding power source that beautifully reproduced all of the tonal colors in my recordings. I couldnt place my finger on any malady I could ascribe to a cold-out-of-the-box solid-state amplifier: It didnt sound hard, steely, or cold. I remember thinking that the SS-101 was going to be a straightforward, if not a terribly exciting, piece of gear to write about. My impressions were quite positive -- just not groundbreaking in any particular area. After a few days of listening in class-AB mode, I switched the SS-101 to class A and let it cook for an afternoon. My, oh my: The subtle changes displayed by the SS-101 turned a fully competent power amplifier into something truly special. Music bloomed, expanded, and engaged me in a way that renewed my spirit and my enthusiasm for listening to music. I began to think I was in some new territory -- but I still had a lot of listening to do. The differences between class A and class AB werent all that overt -- I couldnt hear them while walking casually around the room -- but they were critical improvements nonetheless. The music simply flowed more easily into my ears. The sound relaxed me and reduced the stress of listening for details; there was little point in trying to dissect and analyze what I was hearing. Instead, each recording I played was reproduced with, apparently, none of the electronic byproducts that usually remind me that Im listening through components. The word that kept coming to mind was natural. The types of electronic components showcased in "The Worlds Best Audio System" are set apart by only minute differences. Since I began this column in February 2004, I have written about no component that has been anything less than excellent. 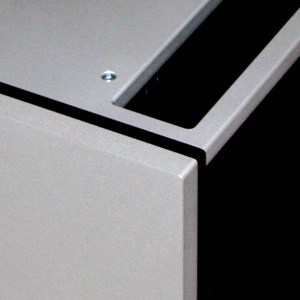 However, each variation of power amplifier that Ive listened to for "TWBAS" has had a unique character that has defined it and, consequently, the type of audiophile who will purchase it. Some examples: The Halcro dm68s ($38,000/pair when available) were ultraprecise, quick, and quiet, but were not the last word in bass depth. The Gryphon Antileon Signature ($24,000) sounded bigger and bolder than the Halcros, with a decidedly "analog" sound that I really missed when it was gone. The Boulder 1060 ($21,000), my long-term reference, was dead quiet -- more so than the Gryphon -- with resolution to spare, and had better bass than the Halcros. The Simaudio Evolution W-8 ($10,500) displayed new levels of warmth and naturalness. While the W-8 was maybe not quite as dead silent as the Boulder, I came to prefer it. Through it, music sounded more like music. That experience directly led to my selling the Boulder. The Vitus Audio SS-101, though rated at only 50Wpc in class-A, sounded as powerful as any of those amplifiers just mentioned. In absolute terms, it sounded most like the Simaudio W-8 -- in short, it played music in a way that drew me in. But it added more to that already fine equation -- something that placed it in a class of its own. Add to my above description of the Simaudio W-8 the sheer resolution and neutrality of the Boulder and Halcros. Can a single product actually possess all of those traits? It seems one can. But that only begins to describe what was different about the Vitus Audio SS-101. I could hear farther into "Fields of Gold," from Eva Cassidys Live at Blues Alley [CD, Blix Street 10046], without losing the emotional connection I had with her voice. Although I dont know how the Vitus performs on the test bench vs. the Halcros, for instance, I can say that it sounded just as quiet and clean. And isnt the sound ultimately what matters? Yet it was that sounds hard-to-describe yet clearly apparent quality of naturalness -- remember that old Yamaha marketing slogan? -- that makes the SS-101 what it is. The more I played my music collection through the Vitus Audio SS-101, the more I appreciated what it was and wasnt doing -- and the more I wanted to listen through it. It had bass slam and power with my hard-rocking Creed discs. It displayed the type of resolution needed to fully exploit the finely crafted Chesky discs in my collection. And the unique voice of James Blunt on "Goodbye My Lover," from Back to Bedlam [CD, Atlantic 83752], was colorful and songlike. If I shifted into audiophile mode, I could dissect each inflection and intonation in his crooning. Instead, I simply listened and felt his emotions, as captured on this recording. The SS-101 transferred the bloom and subtlety on the disc directly into my room. I could not have asked for anything better. The SS-101 played back the singsong melody of "The West Coast of Claire," from Planxtys self-titled 1973 debut [CD, Shanachie 79009], with perfect pace and timing -- and the vocals, which have inspiring range of pitch, were crystal-clear and downright present in my room. Reviewers often write about how certain colored components can make a bad recording sound better than it actually is. The SS-101 didnt do that, but it could make good recordings of music I dont typically enjoy into something I could at least admire. Perhaps this was just the audiophile in me recognizing a sound that was incredibly resolving, but nonetheless it was impressive. With my favorite recordings, on the other hand, I just wanted to listen more and forget about reviewing. The bottom line: I logged more hours in my listening room with the SS-101 at the helm of my system. This meant that I was more often letting music ease the stress of my day. Isnt that what this hobby is supposed to be all about? If you care particularly strongly about, say, soundstaging, or top-end performance, or low-bass extension, I can assure you the SS-101 had no failings in any particular area. It threw a wide, deep soundstage with excellent image focus. Frequency extremes were quite extended, and the middle range was full of color (though empty of colorations) and expressiveness. I believe, though I have no proof -- its more a hunch from my experience -- that the SS-101 could be paired with most any speaker system. I would have no reservations trying the SS-101 with a high-sensitivity horn system, with which the majority of the listening is powered by just the very first watt delivered by the amp. Id also put the Vitus on most any low-impedance beast and at least give it a try. I cant imagine its power supply being taxed by anything less than a dead short. The Vitus Audio SS-101 is as neutral a component as Ive heard, yet it sounds better than other amplifiers for which neutrality is the hallmark. The SS-101 pulls me into the music, something that some of the other super amps fail to do to the same startling degree. I cant think of a better combination of traits: that elusive audiophile goal of musicality (I hate that term, but damned if I can think of a better one) and the reviewer mantra of neutrality. For me, the SS-101 set a new benchmark in listening. Although Im still having a hard time with the fact that my reference electronics will comprise an integrated amplifier, what else can I do? Being honest with myself and with you requires that I wipe out some of the audiophile wisdoms burned into me during my years as a conforming audiophile. Can you see yourself doing the same? Maybe its about time you at least asked yourself the question. As for me, Im buying the review sample of the Vitus Audio SS-101. It will be my new reference amplifier for future installments of this column.